In the early twentieth century, designers often put their work out to sea. Le Corbusier, Swiss-French pioneer of modern architecture, wrote in his seminal 1931 treatise Towards A New Architecture that “a seriously-minded architect (…) will find in a steamship his freedom from an age-long but contemptible enslavement to the past.” The next year, American theatrical and industrial designer Norman Bel Geddes meditated on the same theme in his book Horizons,  wherein he introduced a concept for a modern ocean liner that, “streamlined as to both hull and superstructure,” was “designed for luxurious accommodations, economy of operation, and increased speed performance.” The list goes on: in 1933, Raymond Loewy employed Geddes’s streamlining principles for the SS Princess Anne; between 1946 and 1951, Henry Dreyfuss created six ocean liners for American Export Lines, Inc.; in 1946, Donald Deskey conceived the passenger interiors for the SS Argentina upon its retirement from military duty. Of these designers, Geddes and Deskey were two who developed concepts for living under water, not just on its surface. Geddes exhibited his 1929 concept for an “Aquarium Restaurant” at the 1933 Century of Progress exhibition in Chicago. 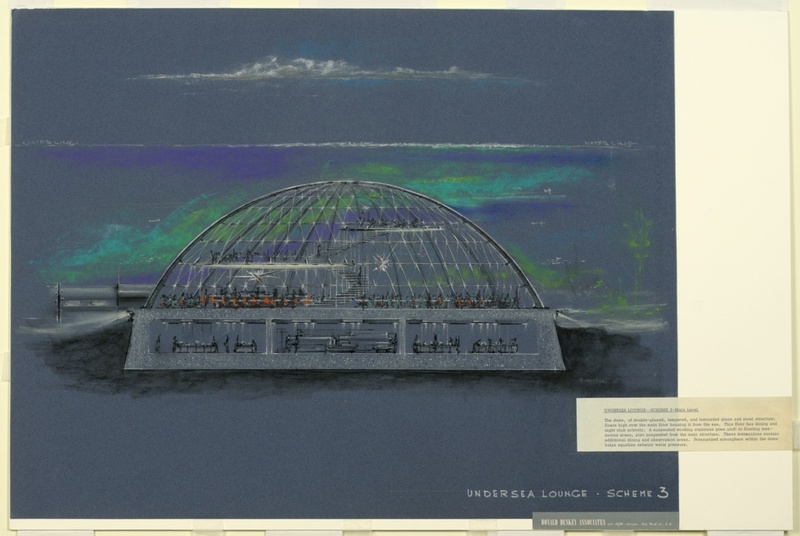 According to Geddes, the restaurant was “suitable only for Fair or amusement grounds where expense is no particular object” and “planned to give the visitor the feeling of having made a journey to the bottom of the sea.” Twenty years later a sophomore industrial design student at Pratt Institute developed his own concept for an Undersea Lounge. That student was Russell Heston, and his project so greatly impressed Donald Deskey that he hired Heston straight out of college to join Donald Deskey Associates’ Special Projects section as a designer-draftsman. Cooper Hewitt has four drawings depicting Deskey and Heston’s collaborative concepts for an Undersea Lounge. The one pictured here features a geodesic dome of steel and double-glazed, tempered, and laminated glass accessed by a pressure chamber at left. This tube opens up to a night club with two mezzanines accessed by a floating spiral staircase at center. Below the sea floor, the dome’s foundations house mechanical and back-of-house facilities. Heston’s use of jewel-tone pastels heightens the shimmering exoticism of the subaquatic environment, while his skill as a technical draftsman impresses upon the viewer the plausibility of such a space. After World War II, when the Space Race led many to look skyward, a handful of scientists, architects, and designers turned their attentions to the sea. Increasing populations, disorganized urbanization, heavy traffic, and the depletion of terrestrial resources inspired researchers to explore alternative habitations, both in outer space and under water—“inner space.” While the possibility of living under water has always piqued interest, it wasn’t until the twentieth century that it became technologically feasible. According to the authoritative text Living and Working in the Sea, by 1957 the US Navy had developed serviceable pressure chambers ashore, and by 1964 numerous aquanauts—including the renowned diver and filmmaker Jacques Cousteau—had lived and worked at depths of 400 feet for periods up to one month. Early underwater architecture featured sophisticated structures comprised of cylinders and spheres but also, more haphazardly, plastic tents, railroad cars, and other disused vehicles. Despite a flurry of interest at midcentury, the enthusiasm for long-term occupation of submarine dwellings quickly waned, and most projects for civilian life undersea were abandoned. Outside of the scientific sphere, much of today’s underwater architecture is a product of the offshore oil and gas industries that are responsible for accelerating the urgency of finding alternatives to terrestrial living. Heston and Deskey’s concepts for submarine leisure have found new life, though. Ian G. Koblick—former president of the Marine Resources Development Foundation and designer of the La Chalupa underwater research laboratory—and Neil Monney—former US Naval Academy Director of Ocean Engineering—repurposed the lab into the only underwater hotel in the US. Today, guests can spend the night at Jules’ Undersea Lodge (named for Jules Verne, who in 1870 authored Twenty Thousand Leagues Under the Sea). The lodge serves as an artificial reef and, in Koblick’s words, creates “a symbiotic relationship between the technology of man and the beauty of nature.” It remains to be seen whether such undersea leisure sites will give rise to more serious, long-term interest in submarine design solutions to our planet’s housing and resource crises. Le Corbusier, Towards A New Architecture (1931; reis., New York: Dover Publications, Inc.) 103. Norman Bel Geddes, Horizons (Boston: Little, Brown, and Company, 1932) 38. Geddes acknowledged that “from time immemorial up to the present moment the ship has always been one of the most fascinating of objects and to a great many people one of the most beautiful,” going on to lament that “commercial minds” have “endeavored to make ships into floating hotels,” an idea “as illogical as painting stripes on a horse and calling it a zebra” (pp. 34-35). B. Alexandra Szerlip wrote in The Man Who Designed the Future: Norman Bel Geddes and the Invention of Twentieth-Century America (Brooklyn: Melville House, 2017) that Geddes was inspired by William Beebe’s recent deep-sea dive in the Bathysphere, the first occasion where a biologist had been able to observe that habitat’s creatures in their natural environment. Christian Burchard and Felix Flesche 9eds. ), Water House, (Munich: Prestel Verlag, 2005), 13. Philip Morrison review of Living and Working in the Sea by James W. Miller and Ian G. Koblick, Scientific American 252, no. 3 (March 1985): 28-30, https://www.jstor.org/stable/24967585. Morrison, review of Living and Working in the Sea, 28. Loewy’s Princess Anne is used for the same purpose: in 1993 it was sunk off the coast of West Palm Beach, FL to serve as a scuba diving site and an artificial reef. “About Us,” Jules’ Undersea Lodge, http://www.jul.com/AboutUs.html.